Oh, you get the famous Apple stickers still included in the box as well so don’t cry. Now as far as the device’s design goes, it looks very similar to previous generation. An aluminum body with some slight adjustments. Power/Sleep, volume, and silent switch still remain in the same spots. Antenna bands are now redesigned to align around the edges of the device as oppose to going across it. What has noticeably changed is on the bottom of the device. Still remains is the speaker on one side, Lightning port in the middle, but on the opposite side, we see what looks like another speaker grille. This here is not to get confused for a secondary speaker, but simply a microphone with holes next to it for symmetry. What is missing here is the 3.5mm headphone jack. You can now use the new Lightning EarPods included in the box or get yourself a pair of Bluetooth wireless headphones. Apple is set to release its own truly wireless earbuds called AirPods in October. If you aren’t a fan of either, you’ll need to use the small Lightning-to-3.5mm headphone jack adapter (also included in the box) to use your regular wired headphones. In the hardware department, we have an improved 12MP iSight camera on the rear with an aperture of 1.8 and it now (finally) features optical image stabilization on the iPhone 7. A welcomed feature that I enjoyed using on Plus models from past generations. As for the FaceTime camera on the front, we have an upgraded 7MP sensor which can record up to 1080p HD video oppose to the 5MP on the 6s that only shot at 720p HD. On the back we also have a Quad-LED True Tone flash for better photos when using the flash. The Home/Touch ID button is another noticeable change. No longer do we have a physical clickable button, but instead it is a pressure sensitive Force Touch touchpad that uses the Taptic Engine for haptic feedback. Took me a bit personally to get used to it but I seem to enjoy it now after a few hours of use. You can change the sensitivity in between 3 different sensitivity levels in Settings. The iPhone 7 also features water and dust resistance. It is finally able to withstand water with its IP67 certification which allows you to submerge your device up to 1 meter for up to 30 minutes, so if you ever have those accidents while sitting on the toilet, dropping it in the pool or use your device in the rain, there won’t be a problem. The dual stereo speakers system is another feature that initially I didn’t really think would make a difference, but from a few minutes of playing music and watching video, it is quite a nice upgrade. It is loud because what it does is when consuming media, it will still blast from the bottom speaker, but when used in landscape mode, the earpiece turns into a secondary speaker giving you stereo sound. Power wise, the iPhone 7 is packing some power with its new 4-core A10 Fusion chip. According to Apple, it is 40% faster than A9 chip in iPhone 6s. 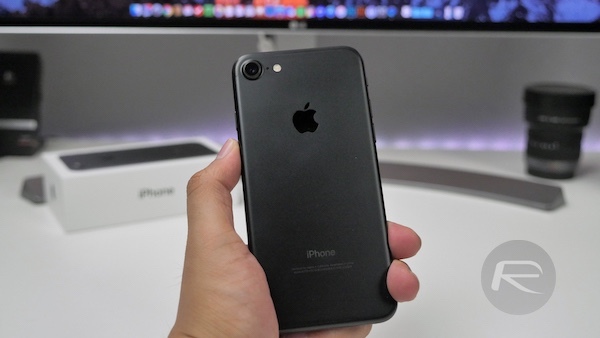 Along with the chip, the 4.7-inch iPhone 7 comes with 2GB of RAM, but if you settle with the 5.5-inch iPhone 7 Plus, you’ll have an advantage as the Plus model now comes packed with 3GB of RAM. While iPhone 7 is fast and all, but in my few hours of usage, I haven’t noticed significant performance difference between 6s and 7. Maybe that will change once I start putting it to task in my day-to-day routine. As for battery, Apple claims iPhone 7 should last 2 hours more than iPhone 6s. I haven’t been able to test this claim yet as I have only have had this device for a few hours now. I will have more on this in my full review of iPhone 7 soon. Overall, iPhone 7 seems like a solid upgrade for those who are on the iPhone 6 or older. I am still not convinced it is a big upgrade if you have a 6s model, but I will have to put it to the test and find out. If you picked up an iPhone 7, which model did you go with? Are these changes something that makes you want to upgrade? Download the “randomly explode and burn your house down” app, makes it more exciting.